Buyer must contacts us BEFORE his/her order is shipped with a mask preference. If desired masks in in stock, it will be shipped. Otherwise we will ship a random mask. 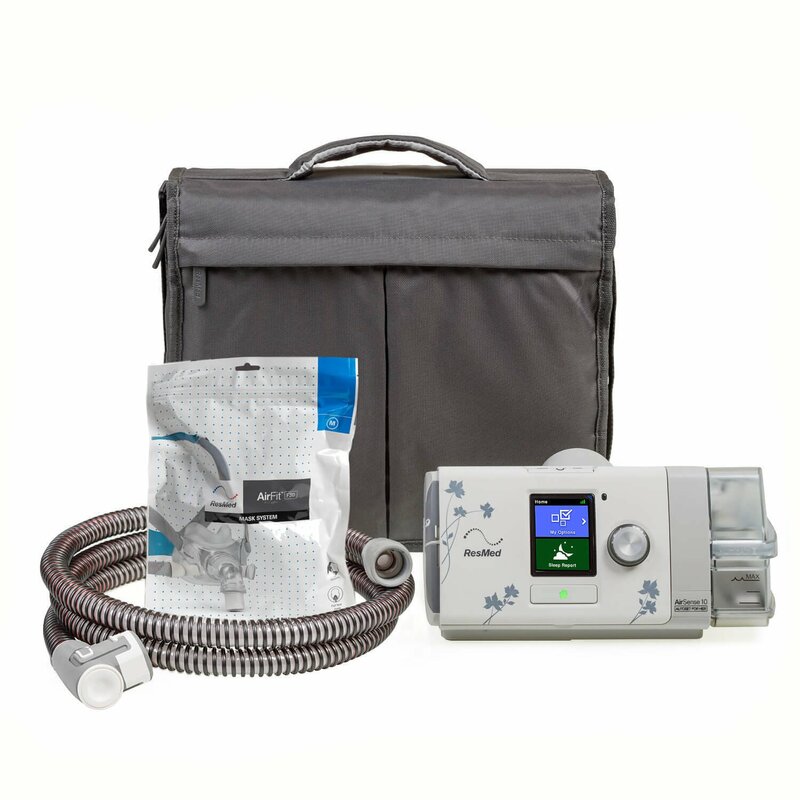 The ResMed AirSense™ 10 AutoSet CPAP Machine with HumidAir™ Heated Humidifier is a uniquely low-volume and lightweight CPAP system that features AutoSet technologies and user-friendly auto-settings for therapy that is both thorough and discreet. With auto-adjusted lighting and SmartStart automated power options, the patient is never burdened by routine setup requirements. Simply place the mask in position and the machine will start. Expiratory Pressure Relief (EPR) adjusts to the slightest changes in exhalation to synchronize airflow with the patient’s breathing patterns. The AutoRamp allows treatment to begin slowly and gradually as the patient falls asleep, and optional Climate Controls can be automated as well, adapting to shifts in temperature for a fully customized therapy experience. A compact device with built-in features, the ResMed AirSense 10 includes a Color LCD display with easy-grip dial for immediate access to data, such as ramp time, humidity levels, pressure relief, fitting assistance and mask type. All of this in a device the size and shape of a bedside clock. The CPAP machines that we sell work with ANY voltage system, including those in Australia and Great Britain. If you have any questions or need additional items, such as a mask or a heated hose please call us at 425-505-3065.